The Denver Art Museum has more than 50,000 students from over 530 Colorado schools walk through its doors each year. Thanks to Scott Reiman and the Reiman Foundation, the Free for Kids program allows all Colorado youth access to the world of art. Reiman believes that all kids should have access to high-quality cultural experiences and educational opportunities like Free for Kids. The program welcomes children from all communities and aligns with the Foundation’s mission to support the dedication of many organizations, particularly those involved in the areas of the arts and children’s initiatives, education and health care. 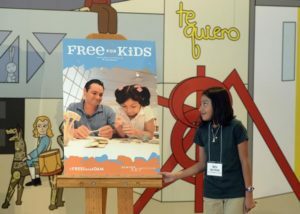 By providing free general admission for all youth visitors, the program fosters imagination, creativity and learning for kids of all ages and of all backgrounds. With the North Building under renovation, the museum is now open every day of the week including Mondays and with a large number of kids out on summer break, they will have the opportunity to visit and explore the various exhibitions like Past the Tangled Present which features the work of Denver artist Jaime Molina; Jeffrey Gibson: Like a Hammer; Stampede: Animals in Art, and many more. Check out the video from kindergartners and first graders from St. Peter and Paul School in Wheat Ridge who shared their thank you letters from a recent visit.